I'm old enough that I remember when and where I was when John Kennedy was assassinated. I was sitting in my 2nd grade classroom at St Philomena's primary school in Des Moines, Washington. That's just south of SeaTac airport, for those of you with a geographic disposition. One of those tiny Tanoy speakers came on (every classroom had one) and the Reverend Mother told us what had happened. I was too young to understand, of course. But I do remember our teacher, Sister Raymond Francis, telling us to get down on our knees and say a prayer for the fallen president. I remember my knees hitting the hard linoleum floor, and for 60 seconds or so, thirty 2nd Graders said our Lord's Prayers and Hail Mary's, and when we were done we went back to work. We couldn't understand why the adults that cared for us were crying. Nor could I understand why, when I got home, my mother was wiping tears from her eyes. Now, of course, I understand. Yesterday was the 8th Anniversary of the attack on the World Trade Center. Like my memory of Kennedy, I'll always remember where I was on that day. I was at work. My wife rang me, telling me that it had been reported that a light plane had hit one of the Towers. I turned on the set that we had at the office, and by God she was right: smoke was pouring out of the building. I should explain that I used to fly light planes, and couldn't understand how any pilot would be stupid enough to hit a New York skyscraper. I put it out of my mind, then climbed in the car to visit a client. A couple of hours later, I was sitting in a board room discussing something that I now forget with clients who were also friends. The door flew open. A secretary announced that one of the towers had collapsed. "One of them?" I thought. We rushed to a television. CNN was broadcasting live. I got there just in time to see the second tower collapse. And like everyone else in the world I suddenly realized what was going on: my homeland was under attack. People were dead. Innocent people. And in that moment I broke down and started to cry uncontrollably. The client that I was visiting - Teresa Maguire, and I'll never forget what she did for me - took me in her arms and let me sob, then led me back to the board room for a moment of quiet. In that moment, the professional nature of our relationship changed. We were simply human beings who didn't understand too much. Over the course of the next few days, I received constant visits by Irish neighbors and friends. All of them wanted to commiserate. To sympathize. To extend their heartfelt feelings of loss and support to me. They did so because I was their friend. I think they also did so because I was American, and in comforting me, they also extended comfort to the land of my birth. Ireland has always had a special relationship with the United States. For hundreds of years, my homeland has extended comfort to the Irish. Thousands of Irish took the words carved on the Statue of Liberty to heart: they immigrated to the States: the tired, the restless, the poor, looking for the Light of freedom that was shining so brightly on that open door. 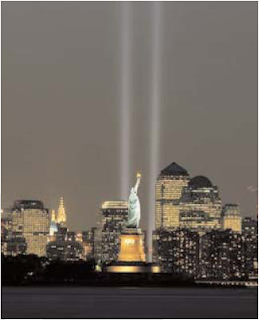 On September 11 2001 the Irish returned the favor, at least to this one Yank so far from home. They extended to me hearts of comfort and kindness; warmth and helpfulness. They let my wet tears of sorrow flow onto their comforting and broad shoulders. I'll always remember where I was on September 11th. I was in Ireland. With a people who's hearts have an infinite capacity to comfort. Powerful stuff, and a glowing testament to the wonderful people that are the Irish.